My family was always pretty good about going to church every Sunday. I was instilled with just the right amount of guilt so that if I did miss a service, I didn’t fully enjoy whatever kept me away. I’m OK with that because I made a lot of great memories and met people who I still consider close friends. Some of the people I’ve grown closest to here in Denver are the ones I sing with in the church choir. Yep, I sing in the church choir. Every Sunday. Wearing a choir robe. I know a lot of individuals from high school and college who will not be surprised by this information in the least. But I rarely talk about my involvement in choir on my blogs. In the spirit of full-disclosure, I love singing in choirs. The bond you form while sharing beautiful music with others is so special. I hope Riley has the chance to be involved in something that makes him feel the same joy and can be done at various stages of life. When I was younger, we often went to church without eating breakfast first. Usually my sister and I had to be there early for choir rehearsal, so it ended up being a relatively long morning. By the time the service was over, we were all famished and ready for something substantial for brunch. The ever-present question as we climbed into the car and buckled our seat belts was, “What do you girls want to eat?” The answer, for me, was almost never pancakes. Pancakes didn’t appeal to me because they felt so heavy. Sometimes my mom would make a Southern staple, gravy and biscuits. But even that felt like too much a lot of the time. Delicious, yes. But very heavy. I much preferred waffles. They still possess the same sweet flavor as pancakes without being quite as dense. We never had the thick, Belgian waffles either; just the run-of-the-mill variety that were slightly thinner, delicately crispy on the outside, and light and airy on the inside. During our time in Japan, I made a lot of pancakes because we didn’t bring our waffle iron with us. So, I’m making up for lost time now by making waffles at least once a week. 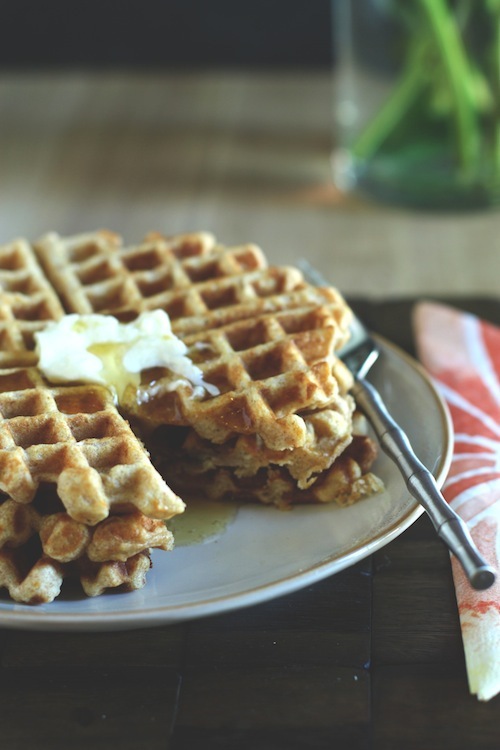 I love to add sweet potato puree to our waffles along with a little whole wheat flour and some cinnamon. This way, I know I’m giving my family some extra nutrition while still providing a treat of sorts. This recipe came to be after making lots of sweet potato puree for Riley and always having it on hand. I needed to find more uses for the leftovers that were suitable for a toddler but also palatable for us parents. These waffles were the perfect solution. Sometimes, I’ll make an entire batch on Monday mornings, transfer the cooled waffles to an airtight container, and keep them in the fridge for the week. When Riley needs breakfast or even a little snack, I’ll pop one in the toaster and in about 30 seconds we’re ready to go. 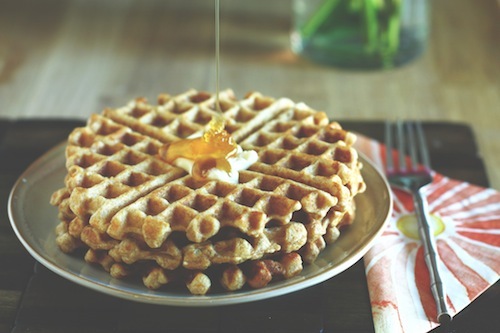 I hope you’ll try these- they are so easy to make and really pack a lot of nutrition for a waffle. And if you're a pancake fan more than a waffle fan, you'll be happy to know that this exact recipe can be used for either. A note on sweet potato puree: I like to bake 2 or 3 sweet potatoes, then puree them in the blender, adding a touch of buttermilk or water if they seem dry. Then I put any extra puree in an ice cube tray to freeze. That way, I have plenty on-hand for soups, pasta sauces, waffles, and yes, even pancakes. Preheat the oven to 200 degrees Fahrenheit. Begin heating your waffle iron. Combine the dry ingredients in a large mixing bowl. In a medium bowl, whisk the buttermilk, eggs, and butter together. Mix the wet ingredients into the dry ingredients until just combined. Stir in the sweet potato puree. Spray the waffle iron with just a little bit of cooking spray to keep the waffles from sticking. Using a 1/3 cup measure, scoop the batter into the center of the waffle iron, close the iron and cook until golden and slightly crisp on the outside, 2-3 minutes. 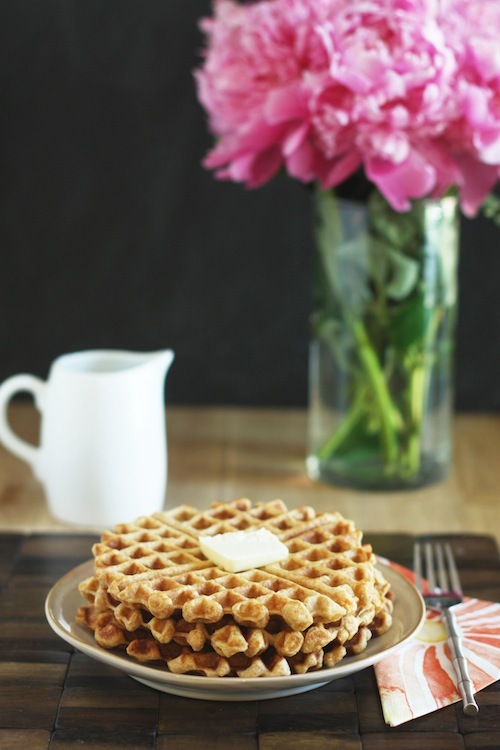 Place each waffle on a cooking rack in the heated oven until ready to serve. Top with maple syrup, honey, or fruit syrup and serve.